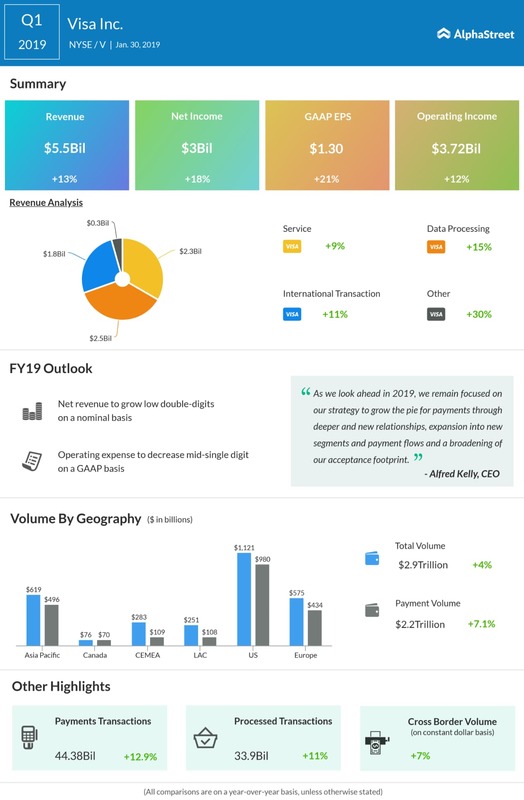 Visa Inc. (V) reported an 18% growth in earnings for the first quarter of fiscal 2019 as the continued growth in payments volume, cross-border volume, and processed transactions drove the revenues higher. The results exceeded analysts’ expectations. The company reaffirmed its full-year 2019 guidance. Following this, the stock inched up over 1% in the after-market session. Net income increased 18% to $3 billion and earnings soared 21% to $1.30 per share. Adjusted earnings grew 21% to $1.30 per share. The company delivered strong results against the backdrop of an uncertain geopolitical environment. Net revenues rose 13% to $5.5 billion driven by continued growth in payments volume, cross-border volume, and processed transactions. Exchange rate shifts versus the prior year negatively impacted reported net revenues growth by about 0.5 percentage points. New revenue accounting standard positively impacted revenue growth by about 1 percentage point. Payments volume for the quarter grew 11% over the prior year on a constant dollar basis and cross-border volume growth, on a constant-dollar basis, was 7%. Total processed transactions, which represent transactions processed by Visa, rose by 11% to 33.9 billion. Service revenues for the first quarter increased 9% year-over-year to $2.3 billion. These are recognized based on payments volume in the prior quarter. Client incentives totaled $1.5 billion in the quarter. Looking ahead, the company reaffirmed its full-year 2019 financial outlook. Net revenue is still expected to grow in the low double-digits on a nominal basis, with approx. 1% of negative foreign currency impact. Annual diluted Class A common stock EPS is still expected to grow in the high teens on a GAAP nominal dollar basis and mid-teens on an adjusted, non-GAAP nominal dollar basis. During the first quarter, the company repurchased 16.9 million shares of class A common stock, at an average price of $137.82 per share, using $2.3 billion of cash on hand. The board of directors authorized a new $8.5 billion class A common stock share repurchase program on January 29. Along with the additional authorization, the company now has $9.8 billion of funds available for share repurchase. 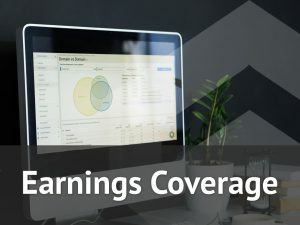 On January 29, the board declared a quarterly cash dividend of $0.25 per share of class A common stock, payable on March 5, 2019, to all holders of record as of February 15, 2019. Shares of Visa ended Wednesday’s regular session up 1.93% at $137.60 on the NYSE. The stock has risen over 11% in the past year and over 5% in the past month.